This morning we noticed a huge spike in search traffic centered around the name “Jodi Uecker-Rust”. 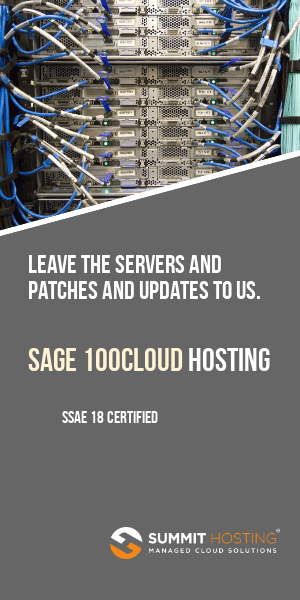 Just as I was about to send out emails trying to see if there may be some personnel changes at Sage North America news broke that the President of Sage Business Solutions, Jodi Uecker-Rust has left the company for personal reasons. So far as I can tell this news hadn’t leaked in advance of the announcement although we spotted search traffic picking up around Jodi’s name based on the post we’d done questioning why she was only an interim leader when she joined Sage back in February 2009. Jodi is what could be termed a “heavy hitter” in the world of accounting software. She spent her career working first for Great Plains Software and ultimately Microsoft (who acquired Great Plains). For a period of time she was very widely considered to be the # 2 in command behind former Great Plains leader Doug Burgum. Jodi was a key player in the acquisition of Navision by Microsoft and even moved her family overseas for a period of time to oversee the deal. 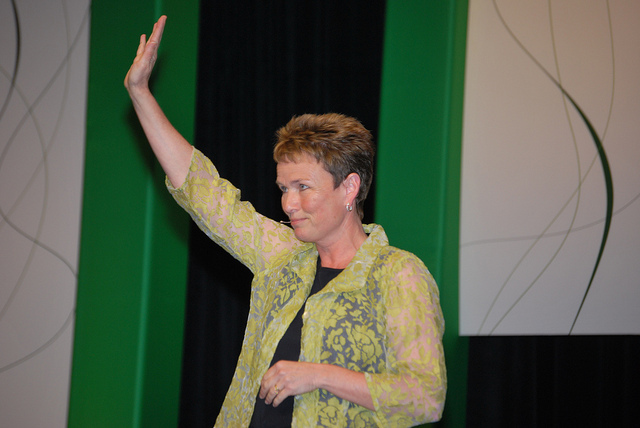 She retired early from Microsoft in 2004 to devote time to some non-profit organizations that she was involved in. 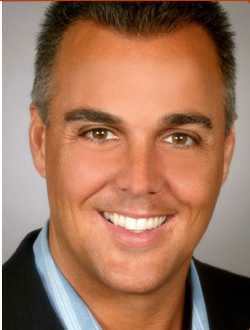 In an email sent to the channel by Paul Johnson, EVP Sage Business Solutions and Tom Miller, VP Channel Management – the departure is stated as for “personal reasons”. Both Tom and Paul go on to say that a replacement is expected to be named for Jodi in the near future. Strangely the notice of such a key departure doesn’t come from Sue Swenson, CEO but rather from executives who reported to Jodi. I have an email into the folks at Sage Public Relations and will update this post as more information is available. To get directly to your question, the message came from Paul and Tom because they have been the principal senior-level communication links to the business partner community so we felt that they were the appropriate ones to inform the partners in this case, too. I hope that helps to clarify. Welcome Jodi Uecker-Rust to Sage – why the Interim Leader title? UPDATE 5-6-2009: As predicted in our original post shown below, Jodi Uecker-Rust was today appointed as President Sage Business Solutions. This is part of a sweeping re-organization that follows a 500 employee workforce reduction on 5-5-2009. 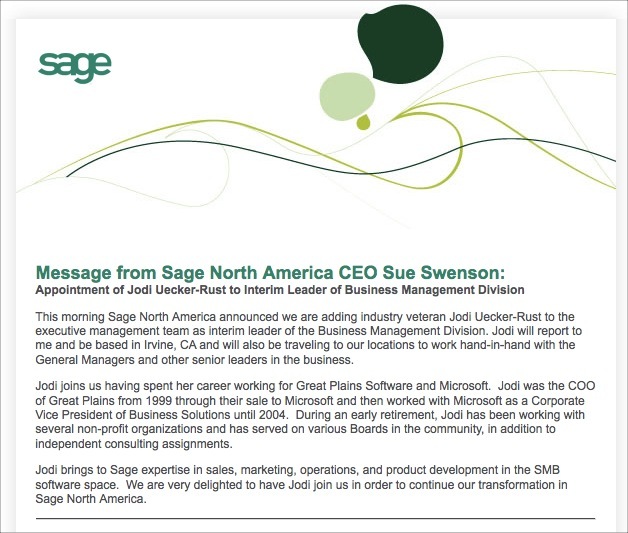 Well respected Great Plains (subsequently Microsoft) veteran Jodi Uecker-Rust has just been announced as the Interim Leader of the Sage North America Business Management Division. This spot was left vacant when Nina Smith departed Sage December 9, 2008. Jodi is what could be termed a “heavy hitter” in the world of accounting software. 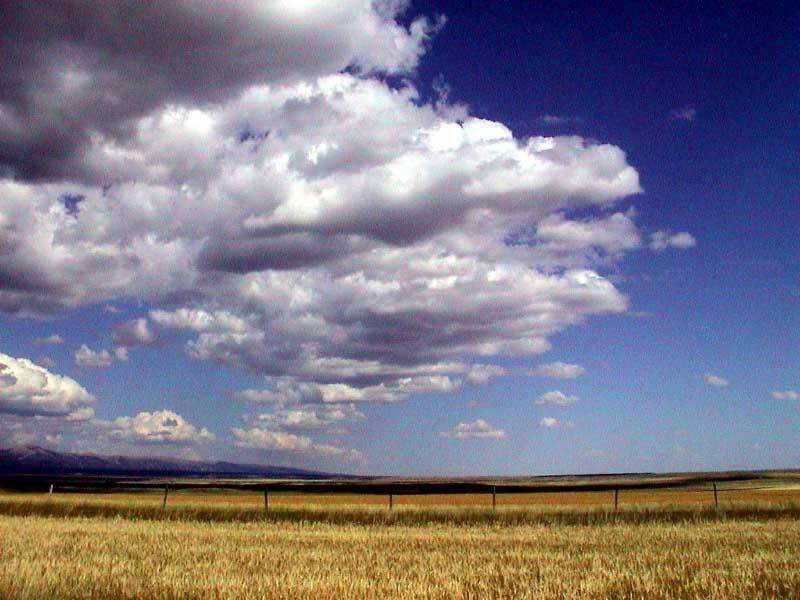 She spent her career working first for Great Plains Software and ultimately Microsoft (who acquired Great Plains). For a period of time she was very widely considered to be the # 2 in command behind former Great Plains leader Doug Burgum. Jodi retired early from Microsoft in 2004 to devote time to some non-profit organizations that she was involved in. Why the “Interim” leader label? One thing I spotted right away is the label “Interim” in Jodi’s title. This seems to indicate that Jodi’s final position may not be leading the Business Management Division but could in fact be a far bigger position? There’s no question Jodi has the experience to lead the Sage North America BMD, so the title of Interim seems to indicate that further reorganization might be in the cards. 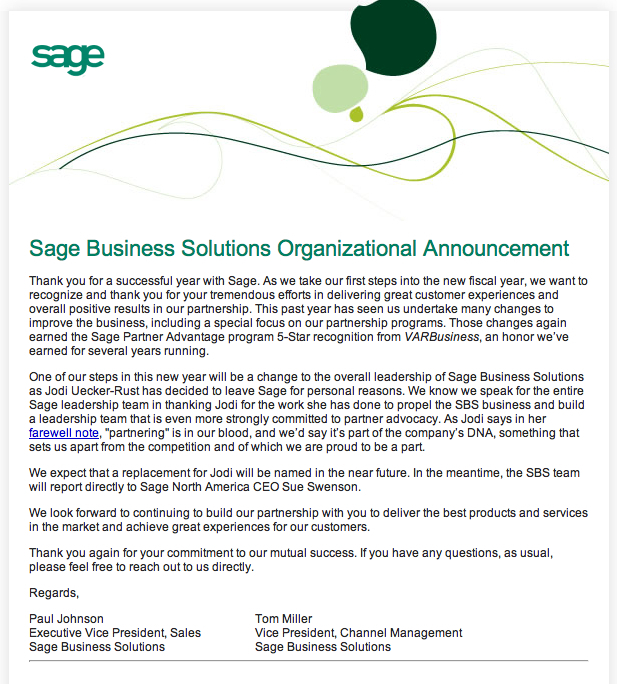 Also the wording of press release indicates that Jodi “join(s) us in order to continue our transformation in Sage North America”. 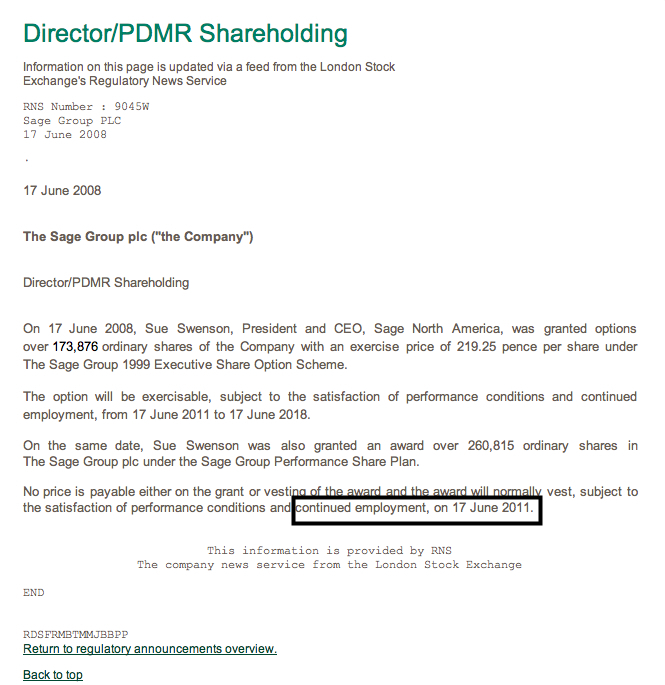 If I were forced to make a guess I’d say that the different divisions at Sage may ultimately consolidate in some form. Perhaps Jodi’s task is to eventually lead them. She has enough experience in this area that her expertise and organizational opinion may have been wanted before any potential re-organization happens. 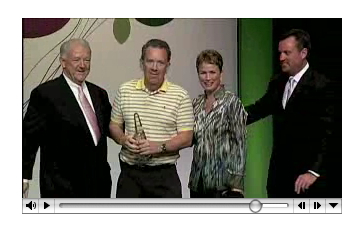 The structure of Sage changed to much more of a divisional setup immediately following the management shakeup in 2007 that saw CEO Ron Verni, CFO Jim Eckstaedt depart. Another option could be an upcoming round of acquisitions with Jodi ultimately leading a new division or acquired company. And finally, there could be absolutely nothing to the title. 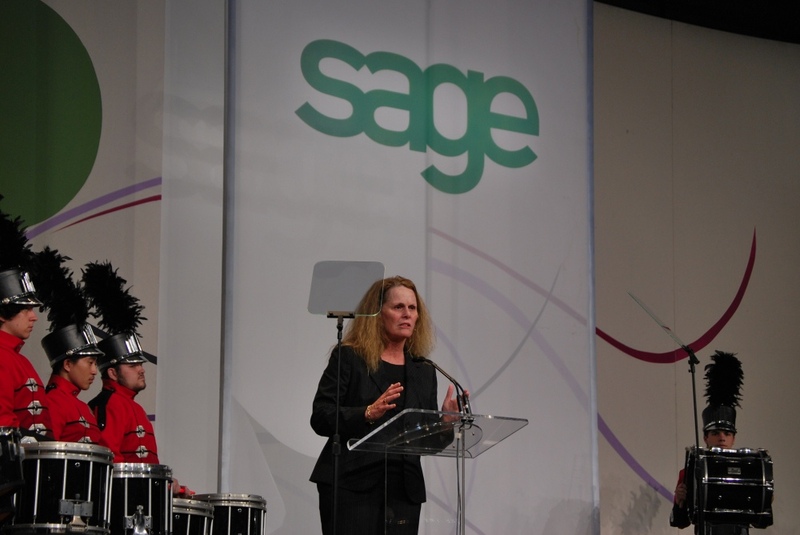 In any event, welcome to Sage North America Jodi!